Mumbai: T.S. Narayanasami, chairman and managing director of Bank of India, loves to eat green chili with chappati at lunch. And, he doesn’t stop eating hot chili till he starts sweating. Hot in the business of banking, the 59-year old boss of publicly traded Bank of India had headed two other public sector banks before shifting to Mumbai – Andhra Bank in Hyderabad and Indian Overseas Bank in Chennai. 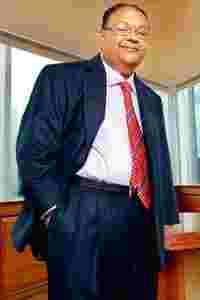 He is one of the very few bank chairmen who has got 100% performance-linked incentives in past three years ever since the Indian government, the majority owner of public sector banks, put in place the incentive system. Under this, every year all state-run banks need to sign a statement of intent with the government on more than a dozen parameters including profits, return on assets and return on equity, deposit and loan growth, etc., and depending on the bank’s performance, the CEO gets the incentive. Bank credit is still growing at more than 25% year-on-year, higher than the Reserve Bank of India’s credit growth target. The objective of the last monetary policy was to contain aggregate demand. That is because money in circulation has been at a much higher level than what was envisaged. Therefore, the credit growth has to be moderated. The Reserve Bank of India (RBI) has taken a series of monetary measures both in the interest of maintaining asset quality as well as in line with the need of the economy. In the past one and a half years, interest rates and banks’ cash reserve ratio (CRR) have gone up considerably and money has been made more expensive. Banks have projected a rather conservative credit growth during the current year – between 18% and 19% and going by the current trend, it will be difficult to surpass this target. Are some banks are more aggressive than others? I won’t say that. If you want to reasonably protect your net interest margin (NIM), you can’t go for an aggressive credit growth. Unless your deposit base expands, you can’t expand your loan book. Indeed, there is an increase in the low-cost current and savings accounts (Casa) but it cannot fund credit expansion. If we want to be aggressive in credit expansion, we need resources. Casa is coming in limited quantity. So, how do you bridge the gap? You go for term deposits. And this pushes up your cost of funds. At the end of the day, you’ll have to be cost effective. So, if you want to enlarge the balance sheet by aggressively going for credit, you will end up diluting your NIM. As long as I depend on retail term deposits, I am cost effective. Institutional deposits cost 11-11.5% today and factor in the cost of CRR (cash reserve ratio), SLR (statutory liquidity ratio) and deposit insurance, the effective cost is more than 13%. That makes lending totally unviable. Bankers normally say your cost of deposits is going up because public sector undertakings are arm-twisting you to pay more. They are auctioning deposits to the highest bidder. Why should that happen? Who is responsible for that? If I want to grow aggressively, I need resources and I need to pay for it. I must be prepared to pay the price. If I want modest growth, I can stand on my own feet and don’t have to run for deposits. So it’s greed for growth and you’re not blackmailed by public sector undertakings? In your desire to grow the balance sheet, you lose focus on markets. At what rate do you lend? If I have to look for borrowers who will take money at 15-15%, the chances of getting the borrower is remote. This will also affect the quality of assets. The credit growth will get moderated in the current environment. Your profitability is under attack? Not at all. If banks depend only on NIM for profitability, then there will be impact on profits. Internationally, non-interest income takes care of a large portion of banks’ establishment cost. In India, this culture is yet to take off. We are focusing on cost control, non-interest income and management of non-performing assets. NIM was the most important aspect of banking sometime back but today it’s one of the important factors. Lower credit growth will not affect my profitability because the quality of assets will be high. So, no cracks in asset quality of Bank of India? Absolutely nothing. Out net non-performing assets (NPA) is half a per cent and gross NPA 1.6%. We are almost on international standards. Because of lower NPA, we will save on provisions. Will you be able to maintain this level? Yes, in the current year also, we are confident of maintaining at this level. Your prime lending rate is 14%. What per cent of your borrowers get loans at PLR? PLR by definition and conceptually relates to your prime customers. But currently because of competition, about 70-80% of customers get loans at below prime rate. Eighty per cent of customers? To be on the safe side, let me say about 60% of customers for the entire banking system. Can’t IBA do something about it? It can’t be addressed. Ideally, I should charge most customers more than my prime rate. But today what is happening is large section of customers is getting loans at below PLR even though they will not conform to the norm of prime customers. We are looking at volume. Every bank needs business. If I start charging more than PLR to most of my customers, there won’t be takers (for my loans) and also the asset quality will be impacted. Why don’t you bring down your PLR and start charging the non-prime customers more? You can’t sit on idle fund. That’s possible when you don’t look at volume and don’t have this kind of branch network. We have learnt to live with it. It has become part of the system. Current bond yield is not a reflection of what happening in the credit market. The yield on ten-year benchmark paper has come down by about 1.25 percentage points in past one and a half months. This is because there is great demand for bonds. Banks’ liability base is going up and they need to put in more money in bonds. The government borrowing is on schedule and there won’t be more supply (of bonds) than what has been envisaged and regulators have permitted FIIs (foreign institutional investors) to invest in government bonds. That has created more demand. Besides, RBI is also buying bonds from the market. The entire yield curve has been inversed. Do you expect the interest rates to rise further? Today inflation is largely driven by external factors on which on which we have no control. We will have to see how things evolve. The inflation growth per se is getting moderated and the major contributing factor to the rising inflation, crude oil price, is softening. But for the depreciation of the rupee, the inflation growth would have come down substantially. We have lost the benefit the falling crude oil price by the currency depreciation. But I am sure that rupee cannot be allowed to depreciate beyond a level. The government continues to be the majority owner of public sector banks. Is that a handicap? In 1990s the Narasimham Committee report had suggested 33% government holding in public sector banks. That would have been the most ideal platform for encouraging competition and autonomy of such banks. But for a variety of reasons the government has not been able to bring down its shareholding below 51%. However, that has not come on the way of public sector banks’ performance. In fact, higher government holding is a comfort for banks. Do you have any plan to bring down the government stake in your bank? It’s about 64% and we can go 13% dilution. But I am very comfortable on the capital front. We retain profits and build our reserves. Conceptually it’s wrong to assume that shareholders will be very happy if we give them high dividends. I for one believe that instead of giving high dividends if must use the fund to strengthen the book value. We are giving finishing touches to our insurance venture. Hopefully by December-January, the first product will be launched. We are also looking for subsidiaries for credit card and asset management businesses. We should be able to finalize the partners in next three months. IBA has not been doing much beside brokering the industry wage pack. Why don’t you close it down? I don’t subscribe to your view at all. The IBA management committee meetings are attended by all members. Although it is a voluntary service organistion, it plays a very important role to bridge the gap between the regulator and the banking system. IBA is proactive and taking up issues of the banking system continuously. Wage negotiations are only a small part of its activities. It is at the instance of IBA that the incentive schemes of the chairman, executive directors and even employees were approved by the finance ministry. It played a very useful role for performance appraisal. But the government bulldozes IBA. This finance minister has been the best finance minister that the country ever has. He has been very receptive and responses to the industry very fast. We are very confident that some decision of the government on higher interest subvention will happen soon. Should RBI open the banking sector for foreign players in 2009? The time is quite right to open up. The strength of PSU banks is their branch network and reach while foreign banks’ strength is their capability to bring in capital. Of course, we have our limitation in the form of age profile, work culture, commitment to work, etc but we have strength. By 2009 every employee should step up his capacity to work. Today ,we are working at 30% of our potential. If we can step that up to 50%, the threat of foreign banks’ entry is no issue.